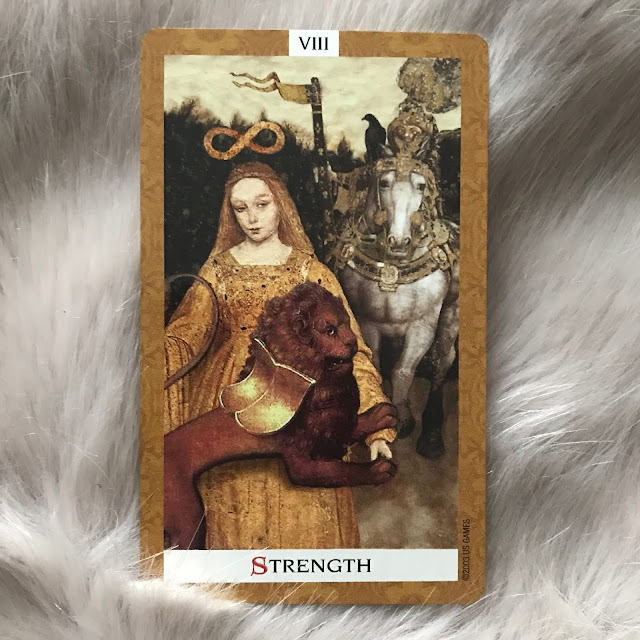 Just before reading today's lesson from A Course in Miracles, I drew the Strength card from Kat Black's Golden Tarot. It did not feel coincidental that these things happened in quick succession. ACIM Workbook Lesson 106 begins: "If you will lay aside the ego's voice, however loudly it may seem to call; if you will not accept it's petty gifts that give you nothing you really want; if you will listen with an open mind, that has not told you what salvation is; then you will hear the mighty Voice of truth, quiet in power, strong in stillness, and completely certain in Its messages." This is a new-to-me deck and it seemed that the lion in the image represented the ego. It certainly has the potential to let out quite a roar! The knight in shining armour, about to arrive at any moment, might even be the purported saviour... however it's clear that the woman does not need external 'salvation'. She has already tamed the lion (the voice of the ego). Unlike the knight, whose power is on display via his muscular steed and finery, the woman's infinite strength is in her stillness. Hers IS a quiet and certain power. That’s not to say she is relaxed or complacent about it - her 'side-eye' indicates that she remains alert, and there appears to be a whip in her right hand, just in case things start to get rowdy. The contrast of the knight's strength and that of the woman is quite striking. One is about strength of force; armour and muscles. The other is quiet and gentle. It may not look much on the outside but it is infinite. Today's ACIM lesson goes further - it also talks about being a voice for others to hear the "Word which lifts the veil that lies upon the earth, and wakes all those who sleep and cannot see". It goes on to say that if you listen "you will hear a Voice which will resound throughout the world through you." Through you - to give, you have first to receive. This is a major theme throughout the Course and it seems to be perfectly illustrated here - her stillness has been imparted to the lion who is sitting in her lap like a pet. Where is strength needed in your life right now? Will you choose a flashy and over-the-top display, or the quiet strength of stillness? Will you give in to the loud roar of the ego, or the quiet Voice of the truth inside? What does it mean for you to give and receive?